One of my favorite things about teaching middle school is the magic of students being old enough to connect with on a more personal level (much more so than elementary students) but they’re also young enough that they sort of buy in to most of what you have them do. While there’s value in students beginning to think independently and challenge the status quo, sometimes teaching is a lot easier when students generally trust most of your decisions. I feel they’re more in that trusting place in middle school. I also like that kids aren’t too cool to get excited about school in middle school. I notice they generally begin to lose some of that as they enter high school. How do you handle a class’s pushback or resistance to your teaching style or a lesson? Share a time where you changed your plans/lesson based on student need or response. I generally try to hear students out in their feedback. Sometimes I think they have pretty valid points. Sometimes I don’t. I didn’t do a very good job of this in my previous school. I taught 5th grade and at the end of a one of our units, I asked students how they would’ve done things differently had they been the teacher. I took a lot of their feedback personally, as if they were telling me I wasn’t doing a good job and they could do better. My current school has a culture that embraces student voice. Every class ends with a few minutes of debrief. I generally ask students what worked, what didn’t; what they felt was a good use of time, what was a waste; what helped in their mathematical understanding, what got in the way; what would they have done the same if they were the teacher, what would they have done differently? As I’ve done this more, I’ve gotten to the point where I really don’t take any of it personally. I generally tend to not ‘argue my point’ whenever a student talks gives more critical feedback in an effort to give them that opportunity to voice the feedback freely. A couple years ago, a student proposed we start using calculators in Pre-Algebra. We had finished the units about learning how to do calculations with rational numbers and we were getting into more complex problem solving. I was having students do all their calculations by hand (gotta practice those skills we just learned!). It was eating up a lot of time and detracting from the true problem-solving as students had to stop and do a 4 digit by 3 digit division problem. The student brought these points up…and they were valid. 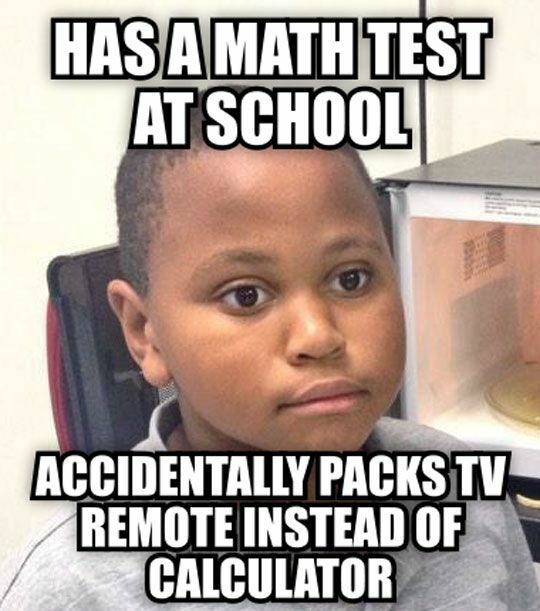 Ever since then, I started allowing calculator use once we got to that unit. I’ve gotten some feedback on a few occasions where we’ve started a new lesson with only about 15 minutes left in class. In my mind, I thought ‘hm, well I can get them to try and do the opening problems and then next class period we can talk about them’ but a few students have shared how you really start getting some momentum and want to talk about what you did and why, but you lose a lot of that when you’re looking at the problem a few days later trying to remember why you did what you did. That makes sense. I’m mindful of that whenever we’re nearing the end of class and try to avoid starting the next lesson if there’s less than 15 minutes of class. As far as my advisory, students really enjoyed ‘YouTube Thursdays’ where different people would pick a video to share with the class that they found interesting/funny/weird etc. We weren’t doing it super often and they kept asking to do it, then complaining if I had planned something else that day. I kept resisting because I wanted to do more face-to-face games and interactions. We compromised. I asked them to stop asking if we could do it every Thursday and since they do enjoy it (and I do think it’s fun too), we would do it every other Thursday and not groan on the Thursdays that we go outside or a play a game inside. Just because a student doesn’t like doing something doesn’t necessarily mean you should stop doing it. I always get pushback from students who don’t want to do visual models with their math. I know that forcing them to do a visual of a scale when solving equations or a number line when showing addition of integers makes them think about the math a bit differently. I’m hoping they grasp the concept of the equal sign being a symbol to say that both sides are the same, not that the equal sign means THE ANSWER! I force them to do it on the easy problems (x + 5 = 12) so when we get to more complex problems (3x + 4.25 = -14x – 3), they’ve gotten some practice with modeling the math in that way that helps them manipulate the equation easier. Perhaps I just need better models. Or perhaps I just have them do the models when it’s the harder problems. More often than not though, they would rather not do it because they actually don’t understand the underlying mathematical concept. In the past, I used to let students listen to music with headphones, but then I found students spending more time trying to find a particular song than working on their math. This year I decided against allowing any music. Students say it helps them focus. I tell them that the research says it doesn’t (for the most part). I then recommend some websites that provide background noise that actually has been proven to help focus. I say they can try those websites outside of class. Some ask if they can just use those background noise websites in class, but then I don’t feel like monitoring who’s actually using the background noise and who’s jamming to Beyonce. It’s easier to just say no music in class. I want them to be present to where they are; to know it’s ok to disconnect for an hour. Additionally, there’s a quiet table out in the hall if they need a less distracting space. In advisory, student’s aren’t super fond of our weekly update emails that they send to me and their parents every Friday. It generally involves some reflection on their classes and I always try to include a fun prompt or question for them to answer as well. It’s a non-negotiable as far as getting it done, but I really try to ask them how to make it better or what they’d rather write about. They generally don’t have any ideas on how to make it better…they just don’t want to do it. Such as life sometimes. I do let them know I enjoy reading their updates, as do their parents, and tell them to let me know whenever they have an idea of how to make the update a bit more meaningful and engaging. All that to say, middle schoolers are less challenging in regards to questioning your pedagogy. I try to honor that trust by learning more and more about how to provide a meaningful learning experience for all my students.